A degree symbol (°) is a must for various science and temperature related documents. I often get asked how to insert a degree symbol in a MS Word document. The process is quite simple and I am going to break down the various methods below. Place the cursor where you wish the degree symbol to appear. From the Ribbon, click on Insert > Symbol > More Symbols. When the Symbols dialog box appears, choose the font you are working with. Then, scroll down until you locate the degree symbol and click on it. Click on Insert and the degree symbol will appear in your document. To add the degree symbol, press ALT + 0176. Upon release of the ALT key, a degree symbol will appear. If you are using a Mac, press option shift 8. 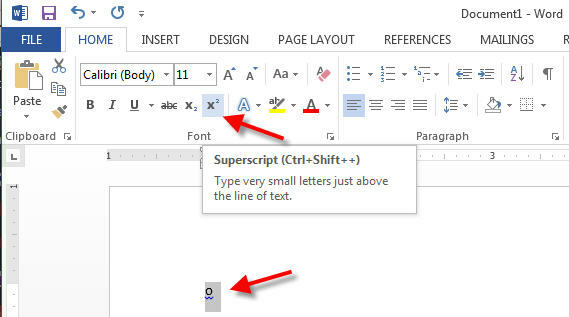 You can also simply copy this degree symbol from this article and paste it into your Word document. Go ahead, copy this degree symbol ° and paste it on your document. It works just as fine. You can also turn the good old letter “O” into a degree symbol. To do this, type lowercase o where you wish the degree symbol to appear. 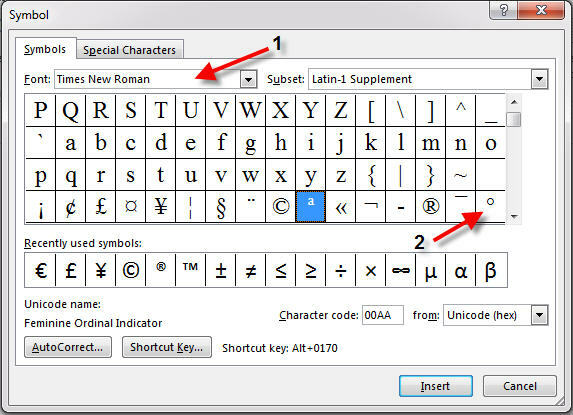 Then, highlight the letter o and click on superscript icon. The letter o will turn into a degree symbol. There you go, these are the various ways you can insert a degree symbol into your Word document.